Last year, 2009, was what many would consider, the year of the Haunted Mansion. Back in September, on 9/9/09 to be exact, the Mansion over on the west coast celebrated its 40th birthday. While I was, unfortunately, unable to make it out to the festivities, I was lucky enough to have my good friend, Lori “We Wants the Redhead” Burke, in attendance and she was gracious enough to hook me up with a bit of “swag” from the event…she is a Rock Star!!! Aside from the wonderful gifts she bestowed on me, another great perk of this celebration was a revival and “reprint” of one of my all time favorite Disney theme park albums, The Story and Song from The Haunted Mansion. While this album was released way back in 1969, I got my first copy of this record (yes it was a record…ahh vinyl, the good old days) back around 1977 or so. As kids, my brothers and I would be loaded into the back of my Dad’s 1974 AMC Hornet for the 20 plus hour ride down to Walt Disney World. During that long ride, I can remember, as if it were yesterday, my younger brother Frankie and I talking about and mustering up our courage to ride the Haunted Mansion. Then, as we walked the long queue line, past the gravestones, we would hear the infamous howling dog and we were scared! When we were back at home, we would flip through the pages of the book that also served as the album cover and listen intently to the story of the Haunted Mansion. We were far braver at that point than during our actual visit to the Mansion, but nonetheless just as excited. Like so much of my vintage Disney vinyl, this album is now framed and hanging on my wall. 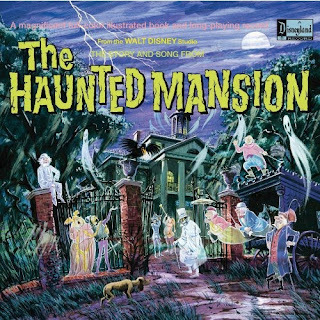 Yet, with the newly released CD of this recording, I am able to once again enjoy the spooky story of The Haunted Mansion and the newly re-mastered recording of Grim Grinning Ghosts, which is also found on the disk. The new CD also doubles as a CD-ROM with fantastic images of Collin Campbell’s original paintings of the images from the accompanying book. Whether you are a long time Mansion fan, or just long to bring a bit of the parks into your everyday, I highly recommend this album. It has certainly stood the test of time and is as good today as it was 40 years ago. Great album - thanks for highlighting it. Disneyland also produced a box set that actually contained this CD, an attraction soundtrack CD, and a vinyl reissue as well, complete with the read-along book with rescanned artwork - and a couple lithographs to boot. They still had a few available as of late December. I have the new version of the vinyl and haven't even opened it yet. The event was amazing and thanks for the shout out Poppa! !